A mostly rural cruise through countryside and small villages & canalside pubs . Market Harborough – A market town mid way between Leicester and Northampton. Visit Welland Park, the town’s museum and the old grammar school, a 17th school built on stilts. Visit nearby Rockingham Castle built by William the Conqueror. If you need to entertain the children then visit Wicksteed Park, one of the biggest and best playgrounds in Europe. Cruise up the famous Foxton Locks - Foxton is the site of a steam powered Inclined Plane, which replaced ten locks and lifted narrow boats 75 feet. It was opened in 1900 but suffered from mechanical and structural problems. The locks were reopened in 1908 and now work beautifully. Milton Keynes has a lot to offer , it is one of the major shopping areas around this area, and is great for the more adventurous Snowzone where you can toboggan on real snow, and where you can go indoor sky-diving. Aylesbury is a busy market town with a number of attractive squares in its centre. The Buckinghamshire County museum is here, which also houses the Roald Dahl Gallery. The marina at Union Wharf has been redeveloped by British Waterways over the last two years. 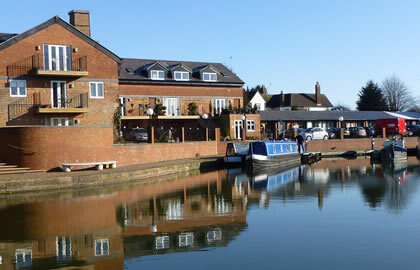 The marina is located at the northern end of Market Harborough - a quaint, traditional English market town that dates from 1203. You can enjoy delicious food and fine ales in the town's historic coaching inns or just potter around the market and the fine selection of family owned shops. From Union Wharf it’s just two hours cruising to the 'Leicester Line' of the Grand Union Canal. The town has may nice pubs, and shops. there is a antique and collectors market every Sunday in the market hall. Eat at the Italian Restaurant based at Union Wharf Marina. Open 12-14.15 & 18.00 til late. The Old Union Canal Society gives guided walks along the canal during summer months and follow the historic town trail. You are welcome to stayed moored up in the Marina and use the car or public transport to visit the many local attractions. The Grand Union canal boasts an extraordinary variety of wildlife, from feeding herons, and hunting owls, to water voles. A number of diverse species thrive in this tranquil and often unique environment. The base at Union Wharf Marina is at the end of the Market Harborough Arm, & you need to cruise for about 2 hours (5 ½ miles) to get back on the the main Grand Union Canal. Stop for a cream tea in the canal side cafe or a well deserved pint in the Foxton Locks Inn. Spend a couple of hours watching the colourful narrow boats passing through the staircase locks. British Waterways organise events based on Foxton Locks. On the 2nd morning walk along the tow path until you find the friendly British waterways lock-keepers by the Locks. They will take a note of your boat name & tell you roughly how long the wait will be to go through the locks, but there is plenty to do whilst you wait. Enjoy an easy cruise as the canal meanders through unspoilt surroundings passing through theHusband Bosworth Tunnel. The Tunnel is 1166 yards long and was opened in 1813. Stop and moor for a while, stroll into Husband Bosworth for a pub, newsagents and general store. The Bell Inn here serves Real Ale & food daily. The Battle of Naesy 1645 was fought 2 miles east of Welford. Here Fairfax's New Model Army routed the Royalists under King Charles I, ensuring the end of the Civil War. it is a good place to moor up for the night as it is 8 hours cruising to here. There is a pub just along the canal in the London direction of the Grand Union, called The New Inn at Buckby Top Lock by the canal. Bugbrooke is a short walk away by bridge 36 , the Wharf Inn is canalside by the Bridge, The Bakers Arms & The Five Bells Pubs are in the village. The village also has stores, PO and a garage. The canal then reaches Gayton Junction where the Northampton Arm of the Grand Union goes away to the left, Gayton marina another of our marinas is situated along this arm. At the Gayton Junction keep going straight on towards London, the canal soon reaches the Village of Blisworth, there is a Pub- The Royal Oak in the village serving Real Ales. 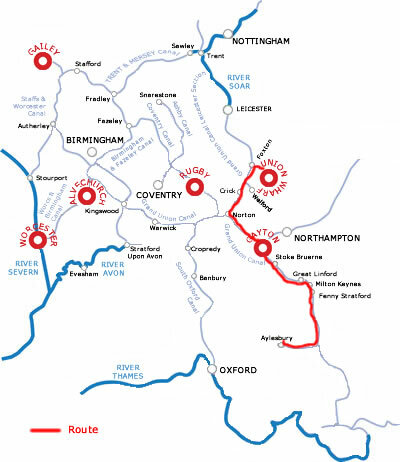 Just outside of the village is the start of Blisworth Tunnel- at 3057 yards, Blisworth is the 3rd longest canal tunnel open to navigation in Britain. The Tunnel opened in 1805 and originally boats were legged through. The tunnel is wide enough for the passing of two 7 ft boats, but keep to the right. At the end of the Tunnel is perhaps the best example of a canal village in the country- Stoke Bruerne. The houses flanking the canal are built mostly of Blisworth Stone. The warehouses and cottages along the Wharf have become a canal centre, with the Canal Museum standing out amongst them. It is housed in a fine old stone warehouse, and the unique collection of exhibits include a traditional narrowboat, steam and diesel engines, and extensive displays of canal memorabilia. Open Summer 10-5, in the winter Tues-Sun 10-4pm. There are a couple of pubs by the Canalside- The Navigation and the Boat Inn, and a couple of restaurants in the village. On leaving Stoke Bruerne you immediately encounter the rest of the Stoke Bruerne Locks- 6 more to do. Locks 16 – 20 are open from 10 am to 3pm with last entry being at 2pm. Stoke Park is ½ mile west of the canal at lock 20. Stoke Park house itself was destroyed by fire, but the pavilions & colonnade survived and are open to the public together with the gardens throughout August 3pm-6pm. The canal then meanders through open landscape in its journey down to Milton Keynes, the village of Grafton Regis is about a mile walk from Bridge 57 and has a pub called the White Hart. The small thatch & stone village of Yardley Gobion is south west from bridge 60 , and has a stores, off licence, and pub called The Coffee pot. The Navigation pub is canalside by Thrupp Wharf at bridge 64. At bridge 65 is the village of Cosgrove, there is a curious pedestrian tunnel under the canal, also a pub canalside called the Barley Mow with mooring(the pub is open all day). There is also a splendid stone canal bridge here, decorated in the Gothic style and built in about 1800. There is one lock to negotiate near the Old Stratford Cut, you will then cross the River Ouse on an iron trunk aqueduct which is carried on stone pillars and was built in 1811. Great Linford is a lovely village built in the traditional golden stone, it is a magnificent canal village with church, manor, farm and almshouses close to the canal. From Great Linford you can get into Milton Keynes on a 15 minute bus journey. Behind the Giffard park pub by bridge 78 there is a late opening store and an off-licence. Fenny Stratford is about 2 hours cruising away, also on the outskirts of Milton Keynes but near a train station from where you can get into the city very easily. The lock is just short of Bridge 22 and a pub is just by the Bridge. Leaving Milton Keynes behind you, the next leg takes you past Leighton Buzzard, a picturesque market town with 17th and 18th century houses and half timbered cottages, a 600 year old cross stands in the centre of the town. Bridge 114 is a good place for mooring, as there are some useful supermarkets to the north. There are also a couple of pubs off to your right. As you leave Leighton Buzzard moor up by Grove Lock, there is a pub & restaurant. There is now a quiet empty stretch of canal with just the occasional lock on your climb up towards the Chiltern hills. A good place to stop is at Marsworth Junction, which is just where the Aylesbury Arm begins and where you turn off right to continue to Aylesbury. The quiet scattered village of Marsworth is close by, as is the Marsworth Reservoir by Bridge 132, there are a couple of pubs nearby to bridge 132 at Startops End, or by bridge 130. You are now on the home run of 6 miles into Aylesbury which is just 5.5 hours away, dropping down slowly through 16 locks. Aylesbury basin itself is spacious and full of boats, there are visitor moorings and pubs nearby, and the town centre is about 3 minutes walk. The Buckinghamshire railway centre is 6 miles north of Aylesbury, - a large site with miniature and full size steam railway. There is a bus from Aylesbury Bus station. The Oak Farm rare Breeds park is ¼ mile south of bridge 15, and has a variety of farm animals for small children to see, handle & feed, there is also a picnic and play area. Waddesdon Manor is west of the town, and is an extraordinary French renaissance style chateau with sumptuous contents and landscaped gardens created by the Rothschild family. By Bus: Bus service from Aylesbury: Arriva The Shires no 16/17. It is 42 hours back to Market Harborough, so about 5 days cruising at 8 hours per day, take time to enjoy Aylesbury/Leighton Buzzard & Milton Keynes on the way back if you have a 14 night holiday.